Thick grey cloud, pouring rain and gale force winds in the weather forecast? 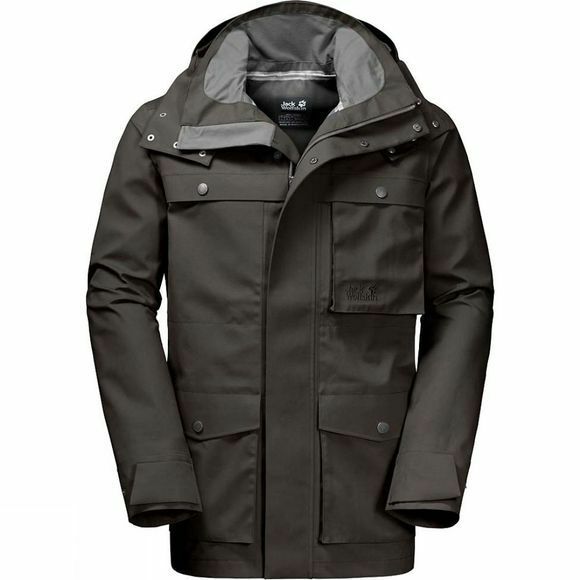 Ideal conditions for the Mens Drumheller Jacket from Jack Wolfskin. This jacket gives you the protection you need in prolonged rain and wind. This is all down to the outer fabric, which is very robust, waterproof and breathable. Because it contains a high proportion of organic cotton, the jacket has a luxuriously soft feel. And it's guaranteed to keep you dry. In lashing rain, simply pull up the hood, fasten the high collar and carry on regardless. After all, why let the weather stop you enjoying yourself?